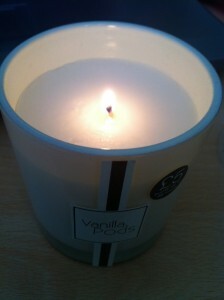 This Vanilla Pods candle was from a recent trip to buy a couple of gift cards and some jewellery for a friend. 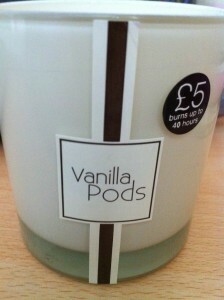 It’s almost impossible not to treat yourself and this Vanilla Pods candle is one of my favourite high street candles. Especially as it is just £5! This candle smells JUST like you’ve put your nose into a bowl of CARTE D’OR ice cream. It is absolutely gorgeous and remember don’t eat it. As soon as I walk into the house it’s pretty obvious I have had a tiny candle splurge, my face goes red and the candle is pretty obvious by the weight in the bag. Oops. As soon as I’ve placed it down its scent is already filling the room and later on when it comes to lighting it, again the smell cascades around the room and house. I now want to eat my house! It burns for ages and ages (it says 40 hours on the packaging but I’ve had about 50+) and if you care for your candle and burn it properly then you’ll get as much use out of this as possible. The jar is pretty handy itself and I use a few around the house for putting pebbles and shells in. Did I mention it is only £5? There are other scents in the same collection like Sweet Bergamot and Velvet Berry. Next time I’m in I will give those a try for sure. Have you tried any of this collection? Thoughts? Let us know in a comment below.